Try quality quiet air compressors by Silentaire Technology and get perfect results for your work. 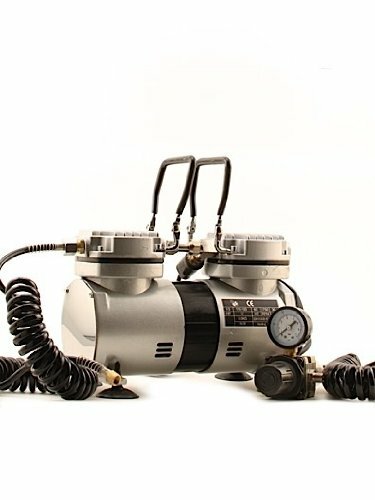 What is so unique about Silentaire Scorpion air compressors? At first, such devices are compelling, delivering consistent and intense airflow. Due to the intensive motor work, it becomes possible to reach a pressure level of 55 PSI and, hence, a maximum power level. Despite the high capacity of the items, the compressors are ultra quiet. The sound level is similar to a quiet street, and such loudness is comfortable for the human ear. Secondly, each compressor is equipped with an automatic shutoff system which switches off the motor when the airbrush is not in use. This function serves to save energy and eliminate the appearance of condensate. Thus, the service life of the device lasts longer, so you can fully enjoy the fault-free operation of the compressor. Like most models of the Scorpion product line, the II-W device is small, versatile, handy, oil-free and almost maintenance-free. Let’s take a close look at each feature. The compact size of the compressor allows you to place it in any room. In this way, it is easy to store the item. The super silent operation isn’t annoying so you can concentrate on spraying. The machine comes with the auto on/off switch to activate the motor. When the airbrush is out of use, the automatic shutoff feature turns the compressor off. To start the engine again, you need to resume the airbrushing process. The device requires little or no maintenance. The Silentaire Scorpion II-W compressor includes the air hose, the universal airbrush adaptor, and the multi airbrush holder. *Additional information. Before you install and use the compressor, read the User Manual and the Instruction attentively. That will help to avoid incorrect assembly and technical failures of the item.